We need fresh air for our life and inhale 20.000 liters of it every day. Modern living conditions demand enhanced attention to the microclimate of our dwellings. the substances that are harmful to our health. Systems of air ventilation help solve these problems since they are aimed at provision of natural air sated by ozone, ions and phytoncides. What we offer are the technical solutions and a wide spectrum of the reliable ventilating equipment and systems of air preparation for either habitation or industrial spaces and the services on designing, installation and service for everyone who cares about healthy and high-grade life. We are ready to offer you design and technical solutions that will meet your technical requirements. In addition, we offer a wide range of complex air-conditioning and ventilation solutions. AS Avesta Servis working for you to develop a ventilation system that meets your needs and your budget! 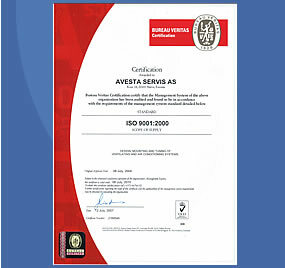 « AS AVESTA SERVIS» is glad to welcome you! Our company offers expert air-conditioning solutions, systems of ventilation and heating for living spaces, industrial buildings and complex construction projects.